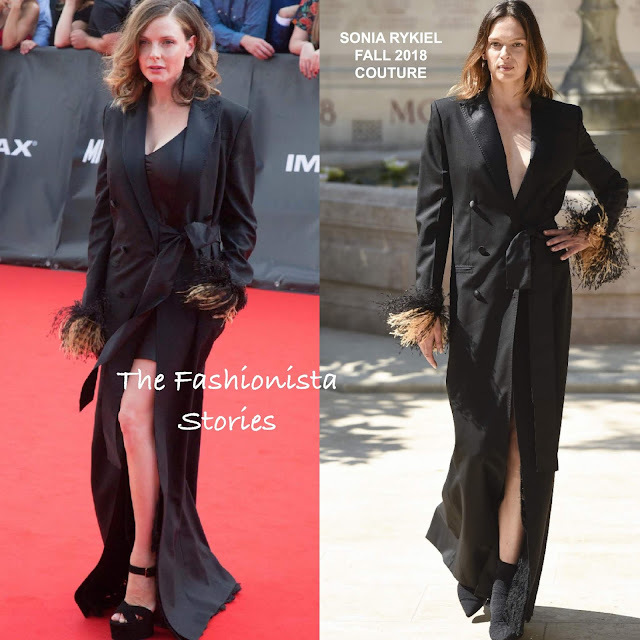 Rebecca Ferguson, who recently gave birth, was on hand for the 'Mission: Impossible - Fallout' premiere yesterday evening(July 12th) in Paris. Her look which hits along the bedroom trend, featured a SONIA RYKIEL FALL 2018 COUTURE black floor length coat with a side front tie waist, contrasting lace lining and contrasting feather cuffs. Underneath her coat, she wore a black mini slip dress. For me, I am not really sold on this which is off season. Maybe if the coat was tailored more, with simple ankle or strappy sandals over her heavy LAURENCE DACADE platform sandals. Also this would be cute as a dress by itself or with tailored crop trousers & sleek pumps in the fall. However, again it just feels a bit too warm for this in general. She finished up with side parted curls. Did Rebecca sell you on her look?